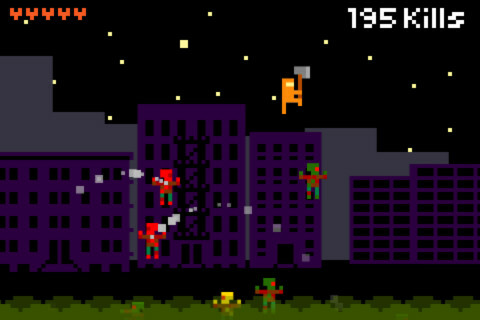 Crush the undead in Simple Arcade's 8-bit style platformer. Zombie Stomp was designed to resemble a game you would have played on long deceased consoles like the Atari 2600, except it's more enjoyable than most of what we've seen for that ancient system. Unabashedly retro, simplicity is the game's greatest strength. That, and killing zombies by crushing their heads. With this in mind, the goal is slaughter as many undead as possible while keeping the hero/survivor in midair, since disappearing off screen or taking damage quickly depletes his health meter. You do this by tilting the iPhone or iPad in such a way that he always lands on a zombie's noggin, as doing this propels the character upwards, even just a little bit at a time. Meanwhile, life-saving health packs and weapons occasionally fall from the sky, and it's in your best interest to grab anything and everything. That said, weapons include a shotgun, hatchet and chainsaw, and repeatedly tapping the screen lets you utilize these tools of destruction. As for the zombies, you'll encounter multiple types, which developer Simple Arcade denotes by color. On that note, there are the standard issue creeps, along with ones that jump higher and others that throw projectiles and vomit. Plan accordingly. Overall, it's a good time, for a couple minutes a day or an hour, but the game's simple nature works for and against it. There is no full-screen iPad support (you'll have to magnify the image), and the lack of Game Center integration dampens the appeal, since leaderboards would have been clutch. Those complaints aside, we appreciate Zombie Stomp for what it is, and think zombie lovers as well as retro aficionados will have no qualms parting with the $0.99 to download it. 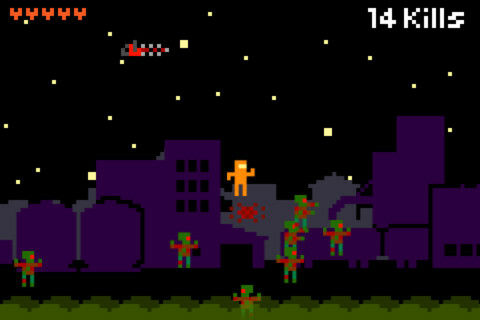 What's Hot: Addictive zombie stomping fun, Atari 2600 graphics and sound effects, multiple zombie types. What's Not: No Game Center and universal iPad support.